Scientists! What does it really take to run a successful crowdfunding campaign for your science? Recently, several scientists have written about their surprise on how their (successful) crowdfunding campaigns actually went. For these scientists, it wasn’t as easy as they expected. Do the expected rules of the crowdfunding road still apply? For this month’s SciFund Voices, we’ll be speaking with a panel of experienced science crowdfunders who will share their experiences. 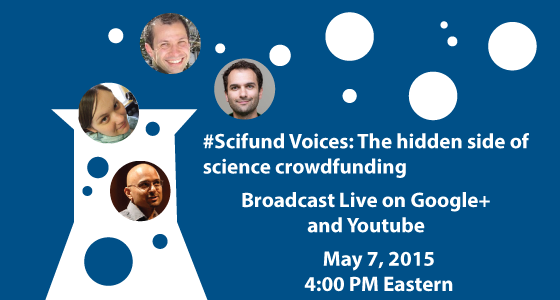 We’ll also be fielding questions from the audience, via Google+ and Twitter (use the #SciFund hashtag)!